This month I got to design with a set of Easter Bunnies from SIWL. 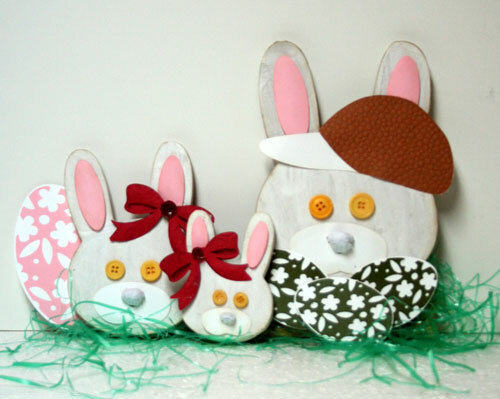 In three graduating sizes, they are absolutely the most adorable bunnies I've ever seen and they were so much fun to work with!!!! 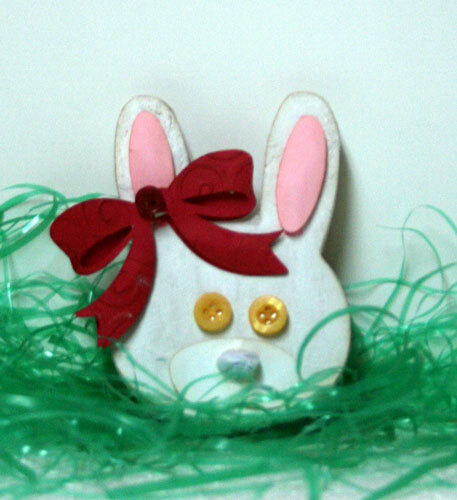 I first painted each bunny white, then added white tissue paper over the wet paint for a little dimension. Then I went to town decorating them. 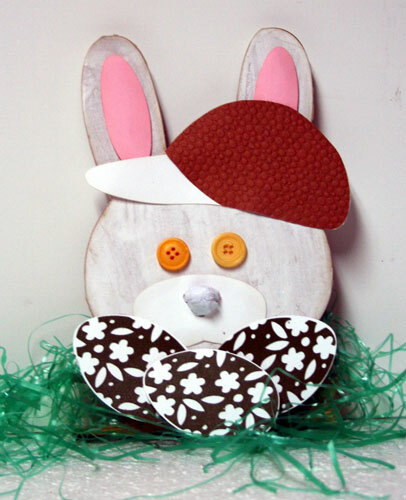 I die cut the eggs and the bunny features from the Easter 2010 Cricut cartridge and the baseball cap from A Child's Year Cricut cartridge. The cap was embossed with a cuttlebug embossing folder. The bow is from A Child's Year Cricut cartridge. The buttons are from my stash. Aren't they just the cutest!!!! 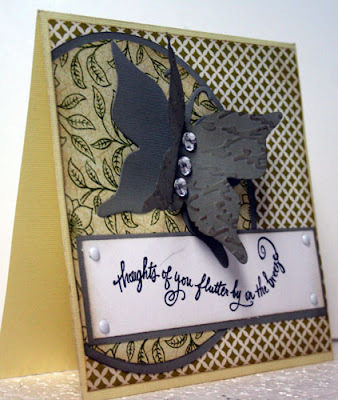 This week's challenge at Justrite Stampers is to create a random act of kindness or a gift for someone special. 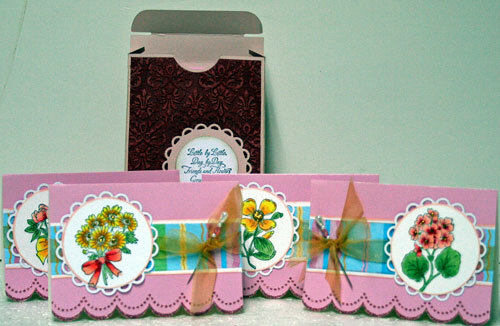 I created this pretty little gift set as a gift for a neighbor. 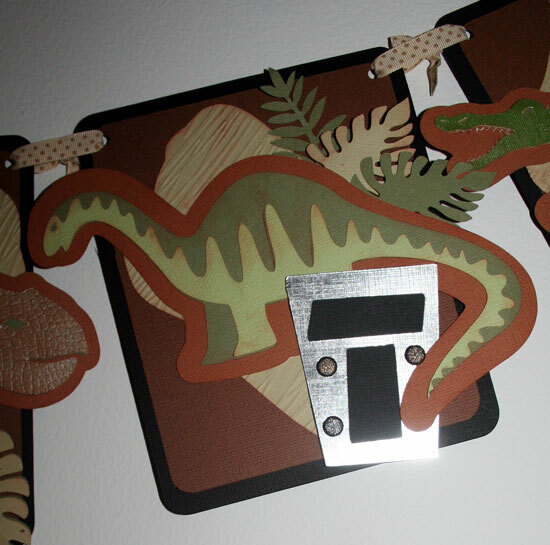 I used my Cricut and cut the box from the new Seasonal Holiday Cards cartridge at 4 1/2" from Core-dinations cardstock. I then cut it again at 4" and cut it apart to get the box layers. I ran the top layer through my Cuttlebug, then sanded the embossed areas. 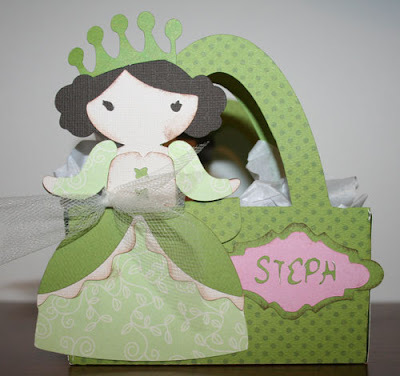 I stamped Garden Fairy Seeds stamp set on the front of the box and die cut it with Nestabilities Circles and Lacey Circles dies. 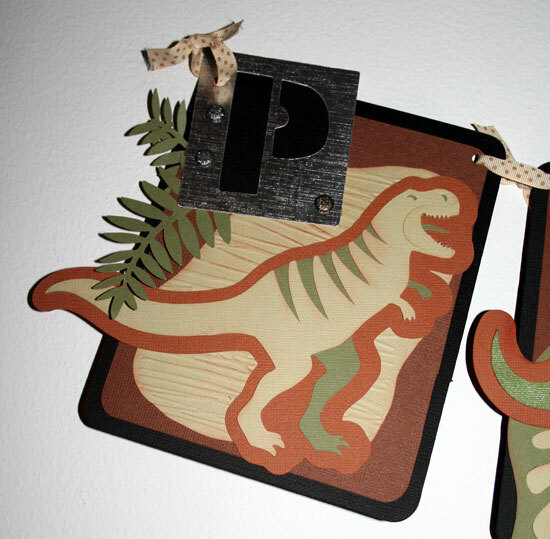 I found these cute little note cards at Target that were screaming for some embellishing. 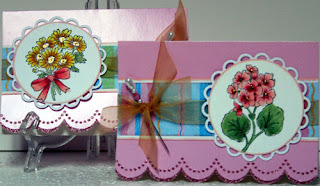 I stamped each of the Beautiful Blossoms and Borders stamps on the cards and then die cut them with my Nestability Circle and Lacey Circle dies. Then I colored the images with my copics. 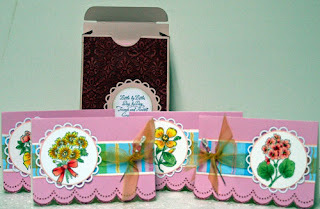 A little pattern paper, a little ribbon and a stickpin completed my cards. I just then touched them up with some stickles. 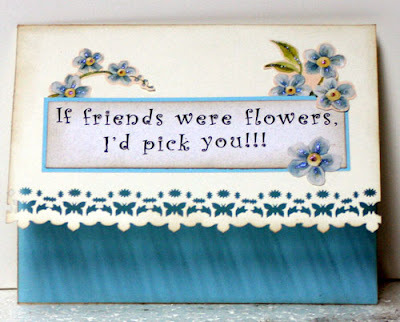 And since their is an ad challenge at the Shabby Tearoom, I'm submitting this card set there also. And I'm very excited because JR is also sponsoring their challenge this week!! We are a world of movers and shakers. We move as a result of jobs, new homes, being in the armed forces. Friends move from home towns and start new lives elsewhere. The Neighborhood stamp set from My StampBox is perfect for sending out hello, welcome or moving cards and notes. 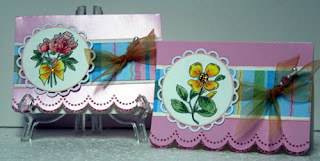 I created these 2 different looks from this stamp set. 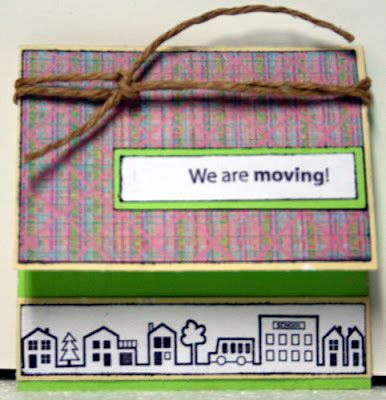 This mini card can easily be created and mailed to friends with the new address noted inside. 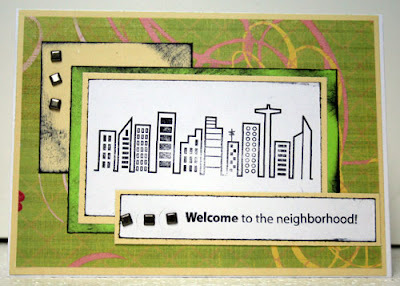 This card would be nice to send to a new family moving into the neighborhood. 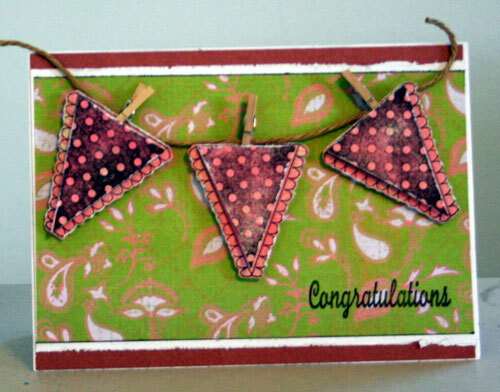 Another project I created this month for Scrappin Stuff are masculine cards. I know that creating something masculine has many of us in a quandry, so I used some Graphic 45 papers to create these cards. 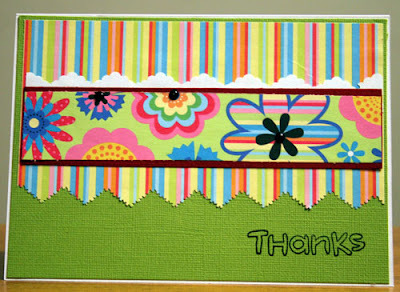 Graphic 45 papers are double sided pattern papers that provide amazing color and theme combinations. 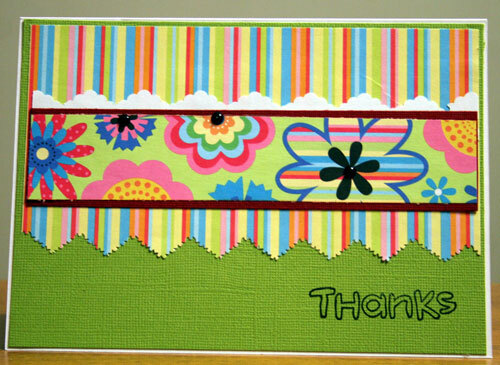 I love using these papers to create cards. Masculine cards can be somewhat difficult to create, but this sports themed paper is perfect for creating masculine cards. Stop by the store and pick up some papers today. I love to create mini books. 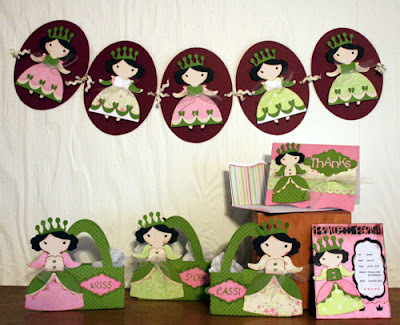 I find they are the perfect project to create when you need a gift. They are quick to make and oh, so much fun. 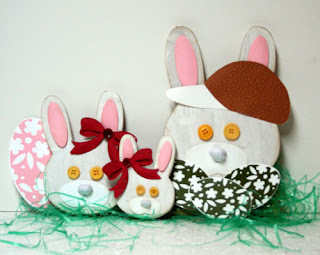 You can also use up tons of scraps with these minis. This month at Scrappin Stuff, I created a School Days mini book. I think this would be a perfect gift for a grandparent to see what a child has been up to during the year. I also think it would be a perfect end of year teacher thank you gift. Details are on the blog. 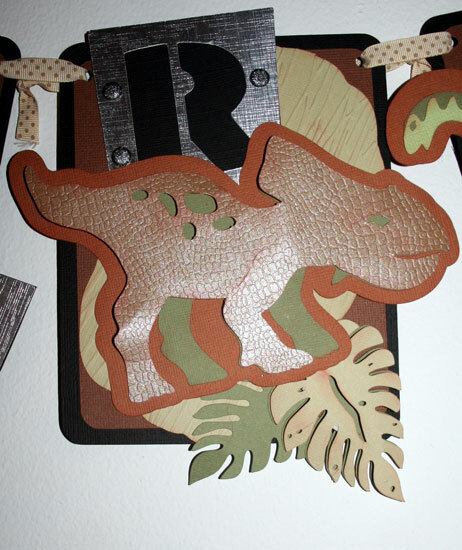 Today's blog post at justimaginecrafts looks at punch 901. This is my all time favorite Kreaxions punch. Today I decided to use this punch along the edge of my card. 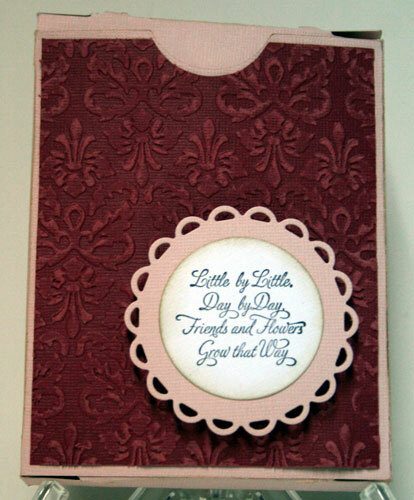 This created a really nice look to my card. Because I wanted the punched border to be more prominent, I placed a piece of blue cardstock on the card back. This allowed the punched border to really pop and interact with the other design elements. 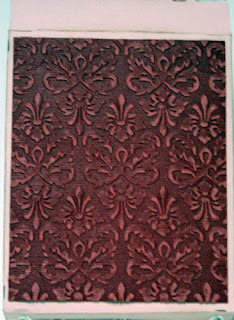 I added just a little ink along the punched border. 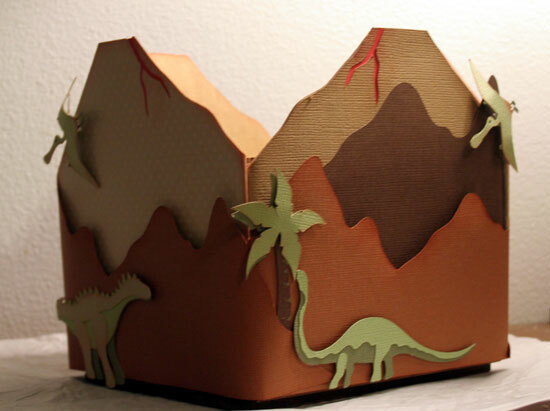 Last week, I posted a Dinosaur party ensemble. 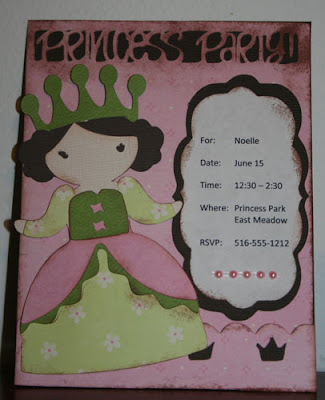 Well today, I think it's time to post a Princess themed party ensemble. This was a DT project for Creativexpress last year where I had to wanted to create a girlie party ensemble. 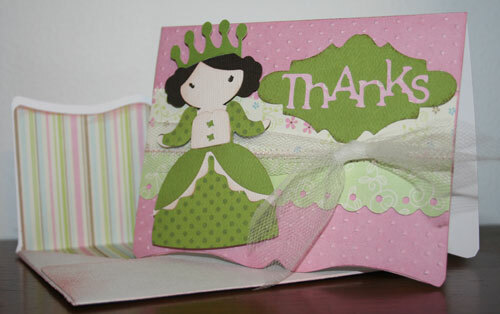 My project consisted of a wall hanging, an invitation, a thank you card with envelope and goodie bags. 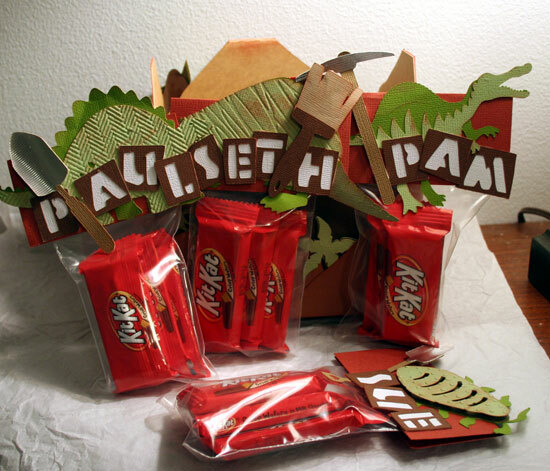 The goodie bags were perfect for adding a few little candies and since each had the child's name, they were also used as table settings. Today's blog post at justimaginecrafts looks at punch 906. This punch, like all the others, has the ability to punch in many different ways depending on which inserts you use. I chose to use the punch without the inserts, which allowd me to create a border to fit the card. As I punched along the striped pattern paper, I lined up the punch at the half way point so that my punches lined up and effectively seperated the sections. I ended up with a really nice pinked edge for the bottom. 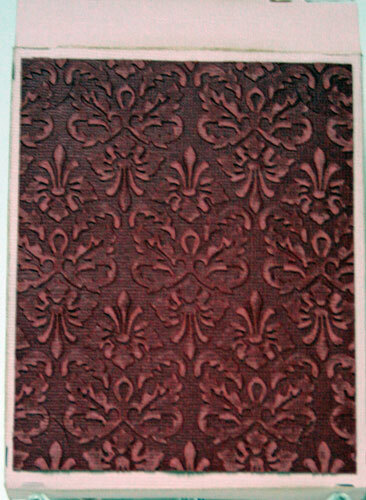 I matted some floral paper on cardstock and placed it on my card. 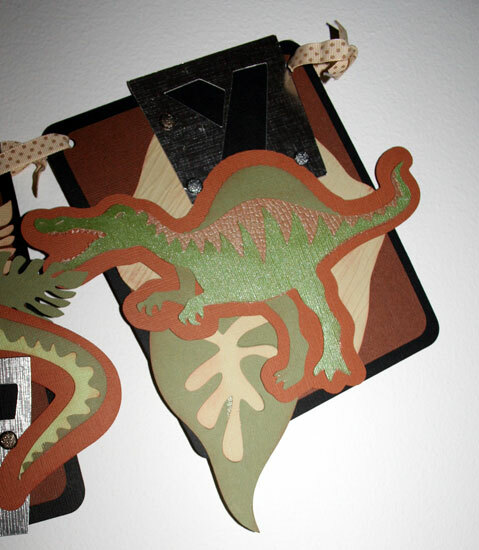 Then, looking at the seperated punched section, I decided to place the scalloped edge along the top edge of my card. A few brads and a simple "Thanks" were all that was needed to finish my card. One of my DT projects for Creativexpress last year was to create a party ensemble. Using the Dinosaur Tracks cartridge, I created a banner, a centerpiece and goody bags. The American Crafts Foil and Pearl papers were perfect for this project. The Cuttlebug Distressed Stripes embossing folder added some great dimension on the background. 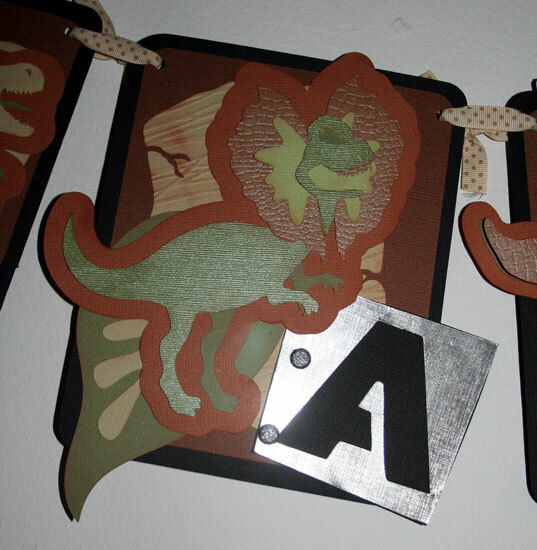 American Crafts glitter brads were a nice addition to the letter blocks. Bo Bunny ribbon tied it all together nicely. 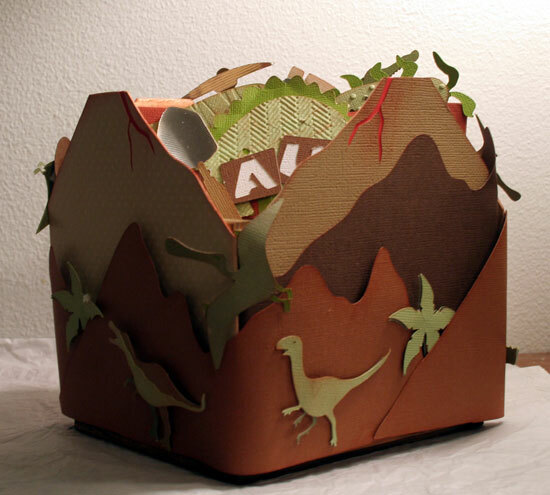 The centerpiece was a wood box onto which I added mountains and volcanos and assorted dinosaurs in their environment. The goody bags were created with smaller dinosaurs as well as the child's name. I absolutely love how this turned out and had so much fun creating it. Just wish I had a child to share it with!!!! For my first post for the new term at Just Imagine, I created a fun and easy card with the Kreaxions Circle Cutter. It is just an amazing tool - it creates the most perfect circles every time you use it. 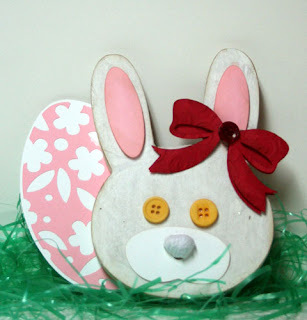 For my card, I wanted a 5" circle and a slightly smaller one and it was so easy. All you do is just adjust the Circle Cutter till you have the size you want - easy, peasy!!!! I wanted the circles to "fall off" the edge of my card and be the focal point for the Kreaxions Butterfly so I just cut off the edges. 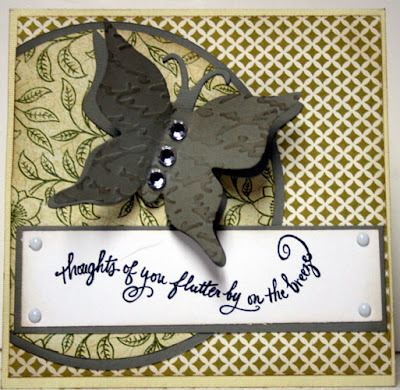 I die cut 2 butterflies and embossed the top one. Check out the dimension using pop dots and rhinestones. Woohoo!!! I am totally thrilled to have been asked to stay with the Just Imagine/Kreaxions Design Team for another term. Please join me in welcoming the following new and returning members to the team. Can't wait to see what the team has in store this term.